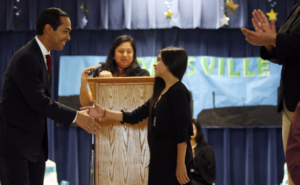 In photo to right, Julian Castro, Secretary of Housing and Urban Development (and former San Antonio Mayor), is helping to inaugurate the Mayor of Adamsville. MSI provides its network of schools, after-school community centers, summer programs and multi-site initiatives with a comprehensive range of services and support programs and tailors them to fit each site’s particular needs, interests and resources. All stakeholders of the community, inside and outside the school, are invited to participate in the training and encouraged to assume mentor roles during Common Micro Time on a regular basis. Our professional development model has been built upon 20 years of experience working with a wide range of learning communities. Wherever we work, we help teachers move away from command and control to an instructional practice of facilitation. 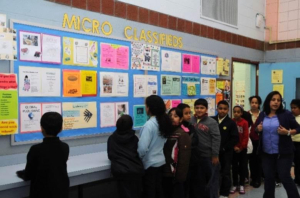 MicroSociety teachers listen and observe, stimulate and engage, provoke and empower. We call this the Micro Mindset and developing it is key to our success. Linkage to a national network of schools.